The team at Whangara farms. The three finalists for 2019’s Ahuwhenua Trophy contest for the top Maori sheep and beef farm will all hold field days this month. Whangara Farms, situated 35km north of Gisborne, has a public field day on April 4 from 9am-3.30pm at Whangara Marae, 368 Pa Rd, Pouawa. Meet 8.30am for a 9am powhiri. Whangara Farms is a partnership of three Maori Incorporations. In 2006, Whangara B5 and Pakarae A and Other Blocks formed the original partnership. 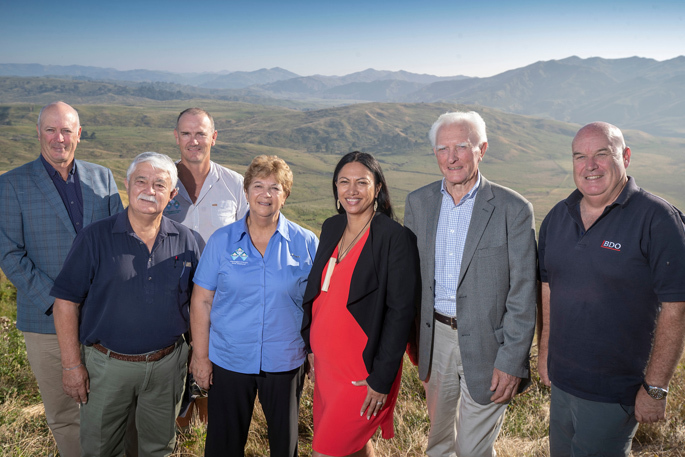 In 2015, Tapuwae Whitiwhiti joined and Whangara Farms Partnership was established. The farm is 8500ha, with 6900ha effective, and has 75,000 stock units – of 45,000 sheep and 30,000 cattle being run on a good balance of flat and steep land. The judges highlighted the partnership is “based on trusted relationships, quality information, regular contact and clear expectations provides economies of scale to achieve greater benefit for all”; has “continuous process of innovation and improvement using science and technology applied to farming systems”; and, “strong environmental focus with land use decisions closely aligned with farming practices”. They also said the “annual Values Day involving staff and governors builds shared commitment to the partnership’s vision and grows team culture”. The Te Awahohonu Forest Trust, which owns Gwavas Station. Te Awahohonu Forest Trust’s Gwavas Station, 50km west of Hastings, has a public field day on April 11, from 9am-3.30pm at 5740 State Highway 50, Tikokino. Meet 8.30am for a 9am powhiri. The trust bought Gwavas Station at auction in February 2011 and it has undergone a significant development programme since. Gwavas Station is 1000ha and the trust leases a further 178ha of adjoining land, combining to provide an effective farming area of 989ha. The farm winters nearly 12,000 stock units – about 50 per cent cattle and 50 per cent sheep. Gwavas is farmed as an intensive dry land finishing property that compliments the Tarawera Station breeding operation. Between 14,000 -16,000 lambs and about 800 cattle are finished annually. The judges highlighted the operation has: “strong governance with trustee succession strategies to maintain knowledge and develop new leaders”; “clear focus on finishing with good pasture and animal management to add value to the wider business”; “well defined business plan with clear process for budget setting, review and reforecasting in short and long term”; and “benefits of investment in soil fertility, pasture improvement, fencing programme and stock water reticulation are now being realised”. Kiriroa Station, owned and operated by husband-and-wife team Eugene and Pania King, 70km northwest of Gisborne, has a public field day on April 18, from 9am-3.30pm at 253 Motu Rd, Matawai. Meet 8.30am for a 9am powhiri. Eugene and Pania King, who own and operate Kiriroa Station. For 12 years the Kings farmed in a whanau partnership – all aiming to one day own their own farms. In 2013 Eugene and Pania decided they’d built enough equity to finally go out on their own. After a year-long search, they found Kiriroa. In March 2014 they moved to Motu. The property is 483ha, with 357ha effective, trading cattle and finishing all stock on-farm and wintering 3800 stock units – 40 per cent cattle and 60 per cent sheep. Judges say: “Environmental leadership on farm and in their community showing what vision, collaboration and hard mahi can achieve”, that the Kings “hold family values central to the way the farming business operates now and into the future”; “very strong financial performance based on excellent management of pastures and stock” and “high level of performance achieved through good advice, sound decision making and attention to detail”. Inaugurated in 1933 by renowned Maori leader, Sir Apirana Ngata, and Governor General Lord Bledisloe, the Ahuwhenua Trophy is the most prestigious award for excellence in Maori farming. The objective was and still is to encourage Maori farmers to improve their land and their overall farming position as kaitiaki. On a three-year rotation, the trophy is competed for by Maori farmers in the sheep and beef, horticulture and dairy sectors.